Do you know what I love about the 1st of every month? It's Doodle Pantry new release time! 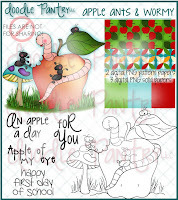 You are going to absolutely love this month's digi stamp sets. I know I do. This month, I chose to use the Apple Ants & Wormy set. This is another very special card to me. I made this card for my favorite cousin's grandson. He has spina bifida and is in a wheelchair. He starts school in a couple weeks, and it's a really big deal for everyone. So, I wanted to send him this card. Isn't this the cutest image? I loved it as soon as I laid eyes on it. I printed the image from the Apple Ants & Wormy set onto white card stock and colored it with Copic markers (apple - R24, R46, R59; worm - E11, E13, E15; ants - N3, N5, N7; grass & leaves - G20, G24, G28; mushroom - BG13, BG45, BG49, YR23). After I was done coloring the image, I added glossy accents to the apple to make it shine. The sentiment, which is also from the Apple Ants & Wormy set was printed on white card stock and punched out with the Curly Label punch from Stampin' Up! and layered onto black chalkstock tile from Canvas Home Basics. It was supposed to resemble a chalkboard, but it was too big and I had to cut it down. The designer paper on the right is from this same digi set, and the designer paper on the left is from Country Flavors Digi Paper Pack. They were matted with black card stock and set at an angle. All of the sticker embellishments are from Stickos by EK Success. Do you want to know the best thing about this set? It's FREE! That's right. Go to Doodle Pantry's Freebies page and download it now! 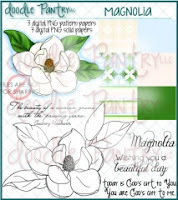 You can also pick up this new Magnolia set, which is free with purchase from August 1 - August 24. 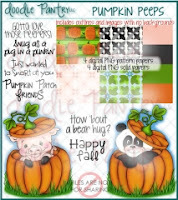 And, if that wasn't enough, you can go to Doodle Pantry's blog and play in this month's challenge and receive the adorable Pumpkin Peeps set just for playing. The challenge runs from August 1 - August 24. The rules are simple, you must use a Doodle Pantry image on your card. You can get a number of free images from the Freebies page. AUGUST SPECIAL: From August 1 - August 8, ALL PRODUCTS are 25% off when you use the coupon code AUG25OFF. How sweet - and I know your cousins grandson will be so excited when he gets this card. Great job. Wow, talk about gorgeous coloring! Fab design too, Susan. Your really did a fantastic job bringing this image to life. This awesome card will certainly bring big smiles! Love this card Susan - so many fabulous elements - like the little ruler that you added. Love it! OH MY!!!! Spot on with EVERYTHING on this card...from the gorgeous coloring to the little ruler, stars and scissors! WOW! What a super fun and creative card, Susan. Thanks so much for stopping and sharing in our challenge this week. It's SO NICE to have you play along with us, and I hope you will join us again soon. Fun card, I love the layout! Thanks for joining us this week at ATSM! Wonderful card, Susan. And your recipient will absolutely love it. What a way to start out the school year! Fabulous card Susan, great design and sure to be treasured for years to come! What a fun card, Susan! Thanks for sharing with us! 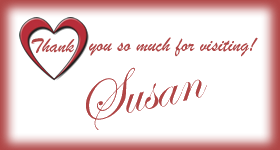 What a super cute card, Susan!. I love the image, the layout and the added embellishments that all tie together nicely. Thanks for joining us at Inkspirational this week. This is a very special card for a special occasion for your cousin's grandson!! The little school stickers are perfect!! A great back to school card! Thanks for sharing with us at Inkspirational! Great layout and image. The colouring is fantastic. I love the little scissors and ruler. How cute is that! These ants are just the cutest with their wormmy friend, lol! Great back to school card, very nice colouring!